The following article by myself on the above exhibition was published by the St Ives Times and Echo on 11th July 2008. "The second, and most significant, part of the Dawn of a Colony joint project between Tate St Ives and Penlee House Gallery, Penzance, entitled Lyrical Light; St Ives (1889-1914), opens at Penlee House on 14th June. This highlights, in particular, how St Ives became a world-renowned centre for both the practice and teaching of landscape and marine painting during this period, as is demonstrated by the fact that a good many of the exhibits were shown, at the time, in international exhibitions in Paris, Brussels, Chicago, Pittsburgh, St Louis and even Buenos Aires. The key initial figure was the future Royal Academician, Adrian Stokes (1854-1935), whose experiences in a variety of European art colonies, resulted in a concentration on the careful study of tones and values, as advocated by the Barbizon School landscape painters. He followed up his Chantrey success of 1888, Upland and Sky (now on show at Tate St Ives), with The Harbour Bar (RA 1889), showing St Ives Bay at eventide from the Ferry House at Lelant, and The Setting Sun (New Gallery 1891), a depiction of a milkmaid at work on the cliffs near Zennor. The latter was considered to be the landscape of the year and was bought by the famous Australian collector, George McCulloch. Indeed, it was later considered to be one of the landscapes of the decade. It has been restored specifically for the exhibition, having sat unloved for many years at the Harris Museum at Preston. Stokes’ paintings drew down to St Ives a number of budding landscape students from the Herkomer Art School at Bushey, including Arnesby Brown, Arthur Meade, Algernon Talmage and Greville Morris. Arnesby Brown, who, in his day, was considered to be "the greatest English landscape painter since Constable", is represented in the exhibition by five works, including three magical depictions of the harbour at St Ives, as evening draws in, with the lights from the town playing across the gently lapping waters. Brown, on his early visits to the town, stayed and painted at Tregethas Farm, near St Erth, which is still owned by the same family, the Hockings, that welcomed him then, and the show at Penlee House includes Brown’s 1896 Royal Academy exhibit, Homeward, depicting cattle returning to the farm at twilight. Considered at the time his best work yet, it is very typical of the Barbizon-inspired work of the St Ives landscapists of this period, leading them to be called ‘The School of Moonrises’. Algernon Talmage, who also later became a Royal Academician, was very influenced by Arnesby Brown at this juncture and is represented by his finest work of the period, The Ford, again showing cattle under moonlight. Arthur Meade was, of course, a stalwart of the colony for fifty years and is represented by two magnificent canvases - Low Tide on the Bar, showing a rainbow reflected in the pools of water on the sands at Hayle, and his greatest success, The Merry Springtime, the first of his well-known bluebell-bedecked woodland scenes, which was described on Show Day in 1905 as "a dream of colour" and which won him an award at the Carnegie International Exhibition in Pittsburgh in 1907. 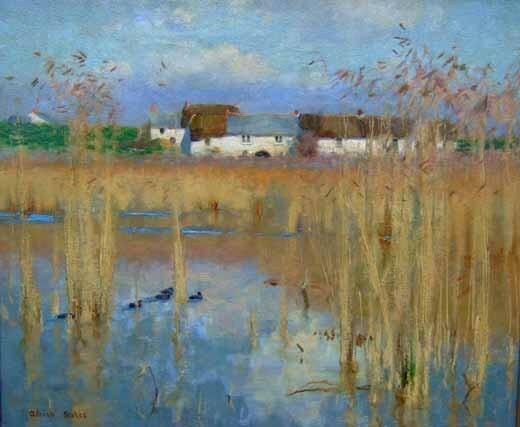 During this period, flat and gently curving lines in landscape were felt to evoke moods of restfulness and the Marazion Marshes were an enduring source of inspiration for all the St Ives landscapists, and marshland scenes, in which the pools of water reflect interesting lighting or cloud effects, by Louis Grier, John Noble Barlow and Adrian Stokes are also included in the exhibition. 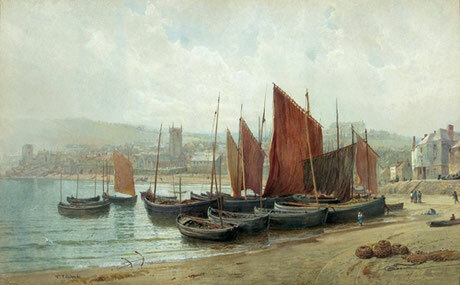 Regular visitor, Alfred East, was also an important influence in the colony and he is represented by his major work, Hayle from Lelant (RA 1892), painted from Lelant Station and showing the mackerel boats laid up, out of season, in the Hayle Estuary. Julius Olsson, who became known as Britain’s greatest seascape painter, produced the finest work of his career in St Ives, particularly in the years 1900-1914, and he is represented by four works, including Moonlit Shore, the painting that secured his reputation in this country when it was bought by the Chantrey Trustess in 1911, and Stormy Evening on the Cornish Coast (RA 1912), a large, impressive canvas combining two of Olsson’s favourite themes - storm and sunset. Vividly coloured, these works, with their aura of romance, finally made pure seascapes acceptable in Britain. One of the highlights of the exhibition is Setting Sun on the Cornish Coast, a nine feet depiction of the sun going down off Porthmeor Beach, by the American Sydney Laurence. Laurence came to St Ives on honeymoon in 1889 and stayed for over a decade, before deserting his wife and family to go gold prospecting in Alaska, where he lost everything. He later became Alaska’s most famous painter and American art historians have been searching for this painting for fifty years, as it was his most famous Cornish work, winning an Honourable Mention at the Paris Salon in 1894. I found it last year in Southampton Art Gallery, under the simple title, Seascape. Given its vast size, it is not a picture that can be overlooked, and yet no-one there had done any research into it or the artist - a typical example of the extraordinary neglect that many of these paintings have suffered. Another painting that has been specifically restored for this exhibition is Moffat Lindner’s The Flowing Tide, again a depiction of sunset off Porthmeor and a work that won an award at Pittsburgh (1905). However, perhaps the most successful marine artist in St Ives in the 1890s was Edmund Fuller, for he pandered to the Victorian love of dramatic incident. A Last Hope, therefore, features a lifeboat off to save the crew of a doomed ship, but, in reality, this is a magnificent wave painting. St Ives also boasted its fair share of fine figure painters. William Titcomb is represented by his well-known works, Old Sea Dogs, medalled in Chicago in 1893 and bought by Nottingham Castle Museum from the seminal exhibition of Cornish Art held there in 1894, and Primitive Methodists at Prayer, St Ives, his world-famous depiction of the fervour of the fishermen in the Fore Street Chapel, which won medals in Paris, Chicago, Brussels and at the Franco-British exhibition of 1908. Marianne Stokes is represented by the much loved Polishing Pans and the similar Lantern Light (RA 1888), where she studies the play of light, not off copper pans, but through different types of glassware, whilst William Fortescue’s The Village Smithy depicts James Couch’s forge close to his home on Trelyon Downs. Finally, Penlee House will be showing, for the first time, their recent acquisition, William Eadie’s masterwork, Where there’s life, there’s hope (RA 1890). The highlight of the watercolour section is John Bromley’s The Harbour, St Ives, a massive work painted from his home, Quay House, which was exhibited at the International Exhibition in Buenos Aires in 1910, and there are contributions to this section from artists such as Charles Mottram, Moulton Foweraker and Arthur White, whilst etchings by Alfred Hartley and Alfred East are also included. It is hoped to find space to hang work by some of the many visiting foreign artists, who did so much to promote the reputation of the colony on the world stage, such as the Americans Elmer Schofield, Guy Carleton Wiggins, Frank Hutton Shill and George McCord, the Canadian Harry Britton, the New Zealander Herbert Babbage and the Australians Will Osborn, Will Ashton and Richard Hayley Lever, the latter being perhaps the most innovative artist working in St Ives in this period. The exhibition, which runs until 13th September, should result in a complete re-evaluation of the place of early St Ives art, not only in the history of Cornish art, but also in national and international contexts. It should not be missed."